Snowbee Boat Landing Net, a new design of landing net for the boat angler. The boat landing net has been upgraded with the use of the latest generation of Rubber Mesh. The fine, hexagonal mesh has a rubber coating, which prevents it from absorbing water, so not only does it prevent the net from smelling of fish, but it completely dries, with just one shake. The rubber coating also prevents hook barbs catching in the mesh, which can be so annoying when you net a fish. 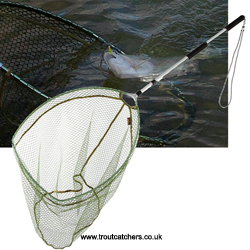 The teardrop shaped frame has a flat front section, to slide quickly under the fish to minimise fish lost at the net. The D-section aluminium is lightweight but remarkably rigid and strong, which together with the die-cast Y-piece, joining the frame to the handle. 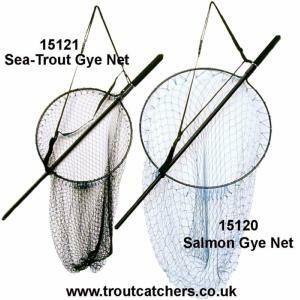 Snowbee Sea Trout Gye Net - 15121 - A traditional Gye style net designed with the Sea-Trout angler in mind, a 18" round frame constructed in strong, lightweight alloy tube. The die cast throat joint allows the frame to slide smoothly down the square section alloy handle, when required. Foam handle grip. Nylon webbing back sling, with quick release Velcro slip, allows net to be deployed, but remain attached to the wearer. The larger 1½" knotless mesh has minimal drag in even the fastest of rivers. Snowbee Sea Trout Gye Net : Length 62" : Folded 43" : Frame: 18" Diam : Net 36"
Snowbee Salmon Trout Gye Net - 15120 - A traditional Salmon Gye style net designed with the Salmon angler in mind, a 24" round frame constructed in strong, lightweight alloy tube. The die cast throat joint allows the frame to slide smoothly down the square section alloy handle, when required. Foam handle grip. Nylon webbing back sling, with quick release Velcro slip, allows net to be deployed, but remain attached to the wearer. The larger 1½" knotless mesh has minimal drag in even the fastest of rivers. Snowbee Salmon Gye Net : Length 73" : Folded 49" : Frame: 24" Diam : Net 36"
Snowbee 3-in-1 Hand Trout Net upgraded using the latest generation of Rubber Mesh. The Snowbee fine, hexagonal mesh has a rubber coating, prevents the 3-in-1 Hand Trout Net from absorbing water, so not only does it prevent the net from smelling of fish, but it completely dries, with just one shake. The rubber coating also prevents hook barbs catching in the mesh, which can be so annoying when you net a fish. The Snowbee 3-in-1 Hand Trout Net D-section aluminium frame is ultra lightweight, yet offers amazing strength and rigidity. Attached to this is Snowbee's new hexagonal Rubber-Mesh knotless net, which has a flat bottom panel for the fish to lie in - ideal for catch & release, as this design minimises scale damage. The net comes complete with two telescopic aluminium handles. The shorter model is only 12" (30cm) when closed, providing an ideal river 'scoop' net, particularly for competition fishing. This telescopes out to 18" (46cm) for additional reach and fits neatly within international competition rules for overall length. The second telescopic handle extends from a closed length of 25" (64cm) to a fully extended length of 45" (115cm), providing an ideal river bank or small Stillwater net. Both handles are fitted with high-density foam grips. This versatile net really is a 3-in-1 for the river or bank angler. 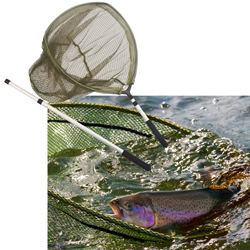 Snowbee 3 in 1 Hand Trout Net Frame Size: 16" x 20" (40 x 50cms).